To evaluate a new, safer way to inject vital dye during chromovitrectomy for dye-assisted macular peeling. Prospective consecutive case series. Enrolled patients underwent macular surgery with a new technique of staining the epiretinal membrane and the internal limiting membrane with vital dyes. Twenty eyes of 20 patients (eight men, 12 women) were affected by idiopathic epiretinal membrane and underwent 25-gauge via pars plana vitrectomy for epiretinal membrane removal. Ten eyes were stained with Membrane Blue-Dual (Brilliant Blue G + trypan blue; DORC, Zuidland, The Netherlands) and 10 eyes were stained with Brilliant Peel (Brillant Blue G; Fluoron GmbH, Ulm, Germany). Preoperatively and postoperatively (1, 3, and 6 months) all patients received a complete ophthalmologic examination with best-corrected visual acuity (BCVA) assessment, swept-source optical coherence tomography, and multifocal electroretinography (mfERG). The mean age of the patients was 67.0 years ± 8.6 years (range: 55 years to 78 years). 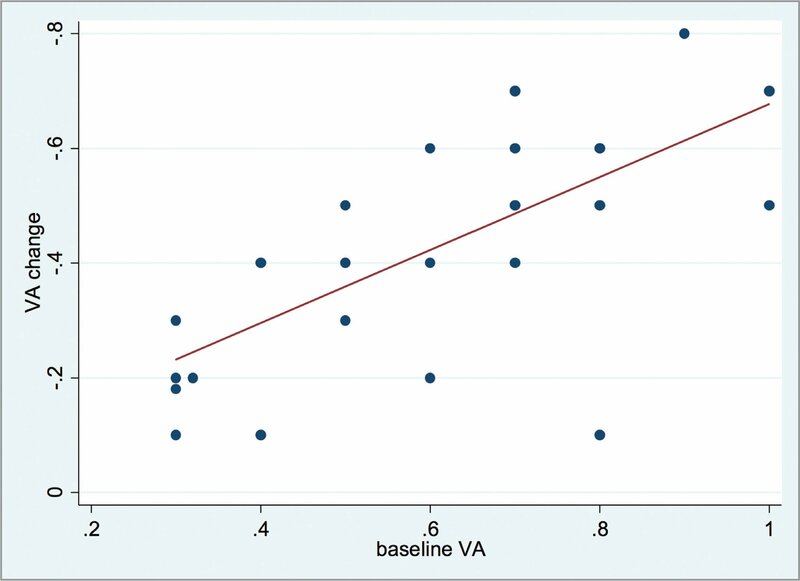 No statistically significant difference in BCVA improvement or central foveal thickness decrease was observed in either group (P > .05). The mfERG showed an increase in electrical response densities 3 months after surgery. The authors describe a new technique to inject vital dye during chromovitrectomy for dye-assisted macular peeling that may help to improve the overall safety of macular surgery. We describe a new way to inject vital dye during chromovitrectomy for dye-assisted macular peeling. This technique is aimed at obtaining a controlled and safer dye injection with quicker instrument exchange, saving time during surgery and inducing little vitreoretinal traction and iatrogenic retinal breaks at the site of the trocar insertion through a vitrectomy probe port. We enrolled 20 eyes of 20 patients; 10 eyes were stained with Membrane Blue-Dual (Brilliant Blue G + trypan blue; DORC, Zuidland, The Netherlands) (MD group) and 10 eyes stained with Brilliant Peel (Fluoron GmbH) (Brillant Blue G) Brilliant Peel (Brillant Blue G; Fluoron GmbH, Ulm, Germany) (BP Group). Preoperatively and postoperatively (at 1, 3, and 6-month follow-ups), all patients received a complete ophthalmologic examination with best-corrected visual acuity (BCVA) assessment, swept-source optical coherence tomography (DRI-OCT Triton; Topcon, Tokyo, Japan) with central foveal thickness (CFT, μm) evaluation, and multifocal electroretinography (mfERG). All patients completed at least 6 months of follow-up. Statistical analyses were performed using Stata 12.1 software (StataCorp, College Station, TX). The results were expressed as the mean ± standard deviation (SD). Paired samples t-tests were used to compare preoperative and postoperative logMAR visual acuities, central foveal thicknesses, and the electrical response densities. A P value of .05 or less was considered statistically significant. A three-way tap was inserted into the line of the vitrectomy probe aspiration. The syringe containing the vital dye was inserted into the third luer connector (Figure 1). During vitrectomy, the tap was closed where the dye was inserted so that only the aspiration line was open. 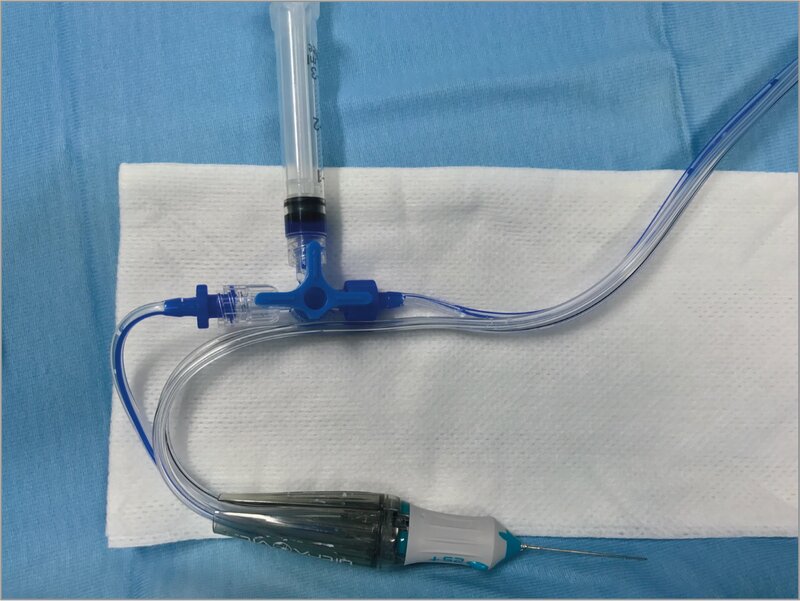 When the core vitrectomy was completed, the cutter was disabled and an amount of balanced saline solution was aspirated through the vitrectomy probe from the inside of the vitreous chamber to clean the aspiration line of vitreous residue. The line of the tap attached to the syringe containing the vital dye was opened into the aspiration line and a part of the dye was injected. The line of the tap containing the dye was then closed and proportional reflux was selected, the tip of the vitrectomy probe was brought close to the surface of the macula and gently pressing the foot pedal of the vitrectomy probe the dye was released with a uniform flow, with no risk of jet-injection causing retinal damage or sub-retinal dye penetration. After a few seconds, vitrectomy modality was selected again, with its cutter disabled, and the vital dye was removed from the vitreous chamber. After staining, the epiretinal membrane (ERM) and then the internal limiting membrane (ILM) were removed with an ILM end-gripping forceps. The peeling was extended to the principal vascular arcades. After peeling, the retinal periphery was checked with active scleral indentation to verify the presence of rhegmatogenous retinal degeneration or breaks. The vitreous chamber was partially filled with air and the cannulas were removed (Supplemental Video available at www.healio.com/OSLIRetina). Connection of the syringe containing the vital dye to the vitrectomy probe. The mean age of the 20 patients was 67.0 years ± 8.6 years (range: 55 years to 78 years). There were eight men and 12 women. Seventeen of the 20 eyes were phakic and underwent combined cataract surgery, and three eyes were pseudophakic. The mean visual acuity (logMAR) improved in all groups, with no statistically significant difference 0.67 ± 0.11 (20/80) at baseline to 0.16 ± 0.14 (20/25) in the MD group and 0.56 ± 0.2 (20/63) to 0.2 ± 0.15 (20/32) in the BP group (Figure 2). The CFT improved after surgery in all the cases, with no statistically significant difference between the two groups (P > .05); it decreased from 426.37 μm ± 108.8 μm to 242.12 μm ± 70.75 μm and from 362 μm ± 76.82 μm to 288 ± 93.68 μm in the MD group and in the BP group, respectively. Change in best-corrected visual acuity (VA) (logMAR) preoperatively versus postoperatively. Preoperatively, the electrical retinal response densities assessed using mfERG in the foveal area (RING 1) and in the perifoveal area (RING 2) decreased. After a mean postoperative period of 3 months, the electrical response densities of the above areas improved in both groups (Figures 3 and 4). In the MD group, RING 1 showed an improvement from 71.63 nV/deg2 ± 12.62 nV/deg2 to 73.01 nV/deg2 ± 19.2 nV/deg2 and RING 2 showed an improvement from 34.96 nV/deg2 ± 7.34 nV/deg2 to 28.81 nV/deg2 ± 15.75 nV/deg2; in the BP group, RING 1 showed an improvement from 69.89 nV/deg2 ± 26.01 nV/deg2 to 102.08 nV/deg2 ± 48.62 nV/deg2 and RING 2 showed an improvement from 44.45 nV/deg2 ± 18.49 nV/deg2 to 46.3 nV/deg2 ± 2.92 nV/deg2. An increase of the electrical response densities of RING 1 and RING 2 was probably associated with the removal of the epiretinal membrane, the reduction of the retinal surface distortion, the recovery of the intra-retinal neuronal network, and the resolution of the macular edema. We had no postoperative complications during the 6-month follow-up. 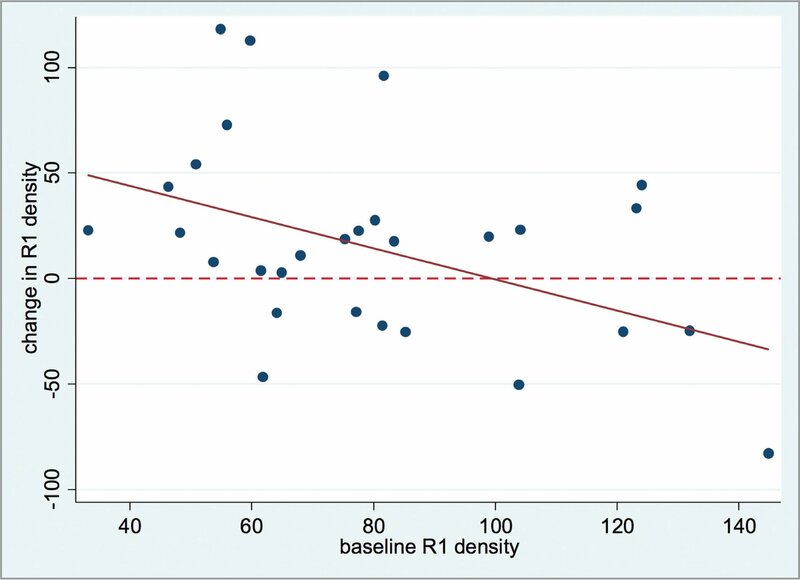 Change in multifocal electroretinography in the foveal area (RING 1 [R1]) density versus baseline. 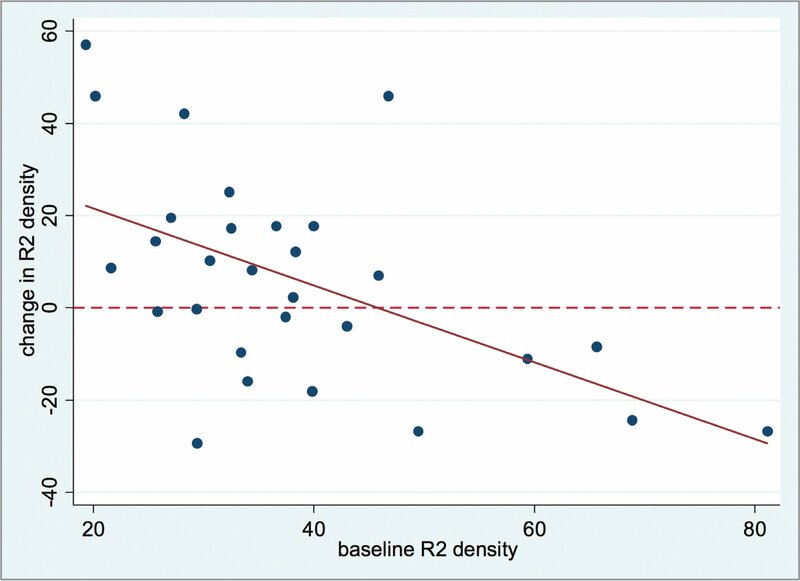 Change in multifocal electroretinography in the perifoveal area (RING 2 [R2]) density versus baseline. The term “chromovitrectomy” refers to the use of vital dyes during vitreoretinal surgery to assist in the identification of pre-retinal tissues and membranes and was first introduced in 2000, when the dye indocyanine green (ICG) was first used to stain the thin semitransparent ILM; it is currently the most commonly used surgical dye in ophthalmology.1 During the past few years, controversial evidence has accumulated indicating that these dyes may have harmful effects. Clinical and experimental studies have demonstrated signs of the retinal toxicity of ICG, which has stimulated research on alternative dyes for chromovitrectomy, so that some additional alternative bio-stains, for example trypan blue (TB), brilliant blue (BriB) and patent blue (PB), are now used for chromovitrectomy,2 even introducing advantages. These new dyes are not without toxicity. TB is an anionic hydrophilic azo dye, which crosses the cell membranes of dead cells and therefore only stains dead tissues/cells. In ophthalmology, TB has greater affinity with the ERM. Regarding the chronic toxicity of TB, it has been reported that it induces arrest of the cell cycle at G0–G1 via increased expression of p21.3 Some researchers have shown that a subretinal injection of 0.05% ICG results in greater retinal damage than a subretinal injection of 0.15% TB.4 BriB is a blue anionic acrylmethane compound, introduced in 2006, which stains the ILM and seems to have no significant in-vivo toxicity. Cervera et al. showed good ILM staining and clinical results, and no signs of toxicity in multifocal ERG.5 However, a decrease in cell viability has been reported; this reduction has been attributed to a cytostatic effect, since it has been shown that BriB acts as a P2X7 receptor antagonist, leading to reduced cell growth.6–8 BriB is more hydrosoluble than ICG and infracyanine green (IfCG); it therefore penetrates less into the cells and is more easily washed away, leaving less residue after surgery. For this reason, BriB represents a good alternative to ICG and IfCG in chromovitrectomy due to its affinity with the ILM. Conventional dye injection using a syringe is an easy procedure, but it can be complicated by subretinal dye migration probably due to retinal microholes created by the jet-injection of the vital dye. Over the years, many authors have published cases of subretinal migration of vital dyes with dire consequences.9,10 The use of a preloaded reservoir containing the dye in order to inject it gently into the vitreous cavity has been proposed as a new, safer way to inject dyes.11 Unfortunately this technique required additional instruments for surgery and additional time to load the reservoir with the dye, thus risking its dispersion during the refill procedure. Our technique introduces the advantage of using standard equipment for macular surgery without adding any other instrument. Proportional reflux produced a controlled and safe flow of the dye inside the eye and avoided the risk of jet-injection and subretinal dye penetration by pressing gently on the foot pedal, similar to the flow obtained with the reservoir. Contrary to the reservoir, which has the port at the top of the tip like the syringe with a backflush does thus leading the jet tangential to the retina surface, the vitrectomy probe has the port on the side of the tip and the flush generated is parallel to the surface of the retina therefore decreasing retinal trauma. Moreover, injecting the dye with the vitrectomy probe at the end of the vitreous removal phase, the surgeon can maintain the instrument inside the eye; there is no need to change the probe for the dye injection nor enter a second time with the vitrectomy probe to aspirate the dye before performing the peeling. Minimizing instrument exchanges during surgery decreases the chance of vitreous incarceration in the sclerotomy and reduces the risk of sclerotomy-related iatrogenic retinal breaks.12 Application of dye agents through reflux was already been described by Hahn in 2015.13 His technique involves the use of the vitrectomy tip to aspirate the dye directly from the syringe containing the vital dye, removing the vitrectomy probe from the eye and insert it again to release the dye through reflux. However, we do not remove the vitrectomy probe from the eye, injecting the dye directly into the aspiration line. The technique of connecting a syringe containing low-viscosity liquids to the suction line of the vitrectomy probe had already been proposed.14 In this technique, only the injection force of the syringe was used. By using active reflux, we used a significantly lower doses of dye to reach the retinal surface with remarkable dye saving. Adequate visualization and identification of the posterior hyaloid, epiretinal membranes and the internal limiting membrane are of paramount importance in modern vitreoretinal surgery. Vital dyes for chromovitrectomy do not lack in toxicity related to the time of retinal exposure and direct light illumination. Dyes routinely used in ophthalmic surgery may have toxic effects, not only by altering cell viability but also cell morphology and membrane status, since the dyes have been found to lead to reduced or altered functional and metabolic capacity.15 Since new visualization systems, such as intraoperative OCT or heads-up surgery for vitreoretinal procedures with digital filters, permit intraoperative visualization of the ILM and ERM without the use of vital dyes, our duty is to reduce the risks related to chromo-vitrectomy. We propose this new technique that has fewer risks and is quicker than traditional chromovitrectomy procedures, which therefore may make it useful for increasing the overall safety of macular surgery. Cervera E, Diaz-Llopis M, Salom D, Udaondo P, Amselem L. [Internal limiting membrane staining using intravitreal brilliant blue G: Good help for vitreo-retinal surgeon in training]. Arch Soc Esp Oftalmol. 2007;82(2):71–72. From the Department of Translational Surgery and Medicine, Ophthalmology, University of Florence, Careggi, Florence, Italy. Address correspondence to Lucia Finocchio, MD, Azienda Ospedaliero – Universitaria Careggi, Centro Traumatologico Ortopedico (CTO), Largo Palagi, 1, Firenze 50139, Italy; email: luciafinocchio@gmail.com.